The Diamond winner is Jody G. and her creative use of treat bags! The Emerald winner is Sue R. with her beautiful butterfly card. The Ruby winner is Dorothy S. and her clever Dizzy Circles card. Congratulations, Ladies! Be sure to grab your blog badge from the top of this page. Thank you so much to all who took the time to enter the color dare. We really appreciate you! There is still time to join the current color dare! 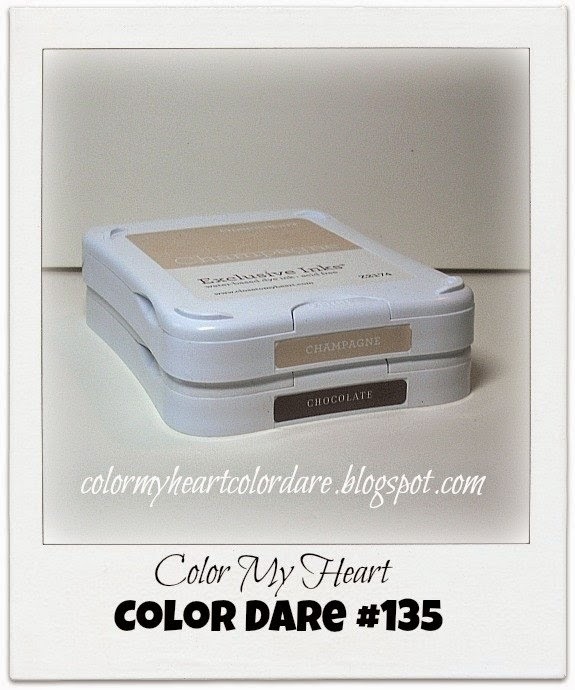 Color Dare #135 features Champagne and Chocolate with White as an option. If you don't have those exact colors just use something close. This color dare will close Thursday at 9:00pm CDT. See sidebar for details on how to join us! Today we have some neutrals for you! Last week's challenge was a 7 color challenge and we had a handful of brave people willing to undertake it. They did an amazing job and as usual the voting was very close! The color scheme was from the Close To My Heart Wanderful paper scheme and included Smoothie, Honey, Flaxen, Crystal Blue, Gypsy, Black and Colonial White. 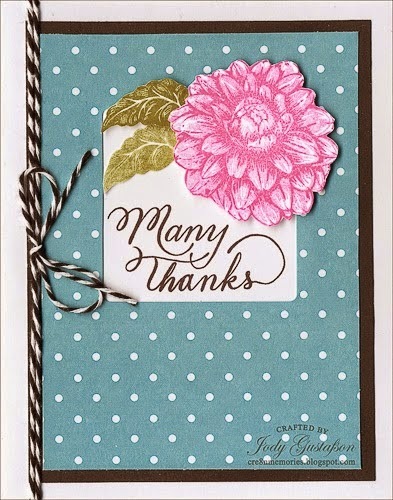 Our Diamond Award Winner is Jody Gustafson again with a wonderful assortment of cards featuring random stamping. You really need to check out her blog post! 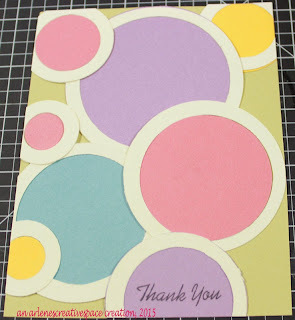 Our Emerald Award Winner is another frequent Color Dare winner, Arlene Bonsma, with her delightfully fun Pinterest inspired circle card. Our RubyAward Winner is Sue Reynolds, another frequent Color Dare winner, with her terrific Easter Egg card. Congratulations to these very talented women! Please visit their blogs and leave them some appreciation. It's time to announce the Monthly Prize Winner for February 2015! You were selected as our Prize Winner for February! Please contact me with your mailing address at stamplady@kc.rr.com. Thanks for joining us at Color My Heart! We hope to see more of your artwork soon! Here is some wonderful inspiration from our amazing Design Team! 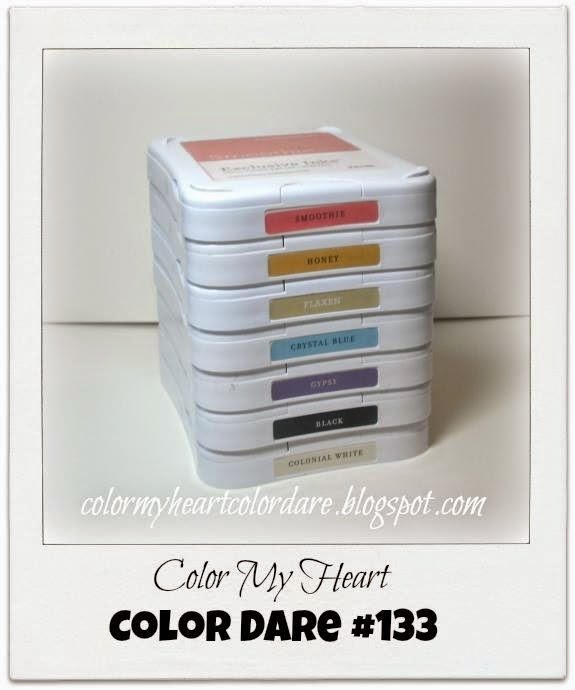 Hi and welcome to the Color Dare #132 winner post for this week! We had some really lovely entries for this Color Dare. Thank you to all who partcipated! We really appreciate you and your talents. Our Diamond winner is Sue and her lovely hummingbird card. Stunning, isn't it! 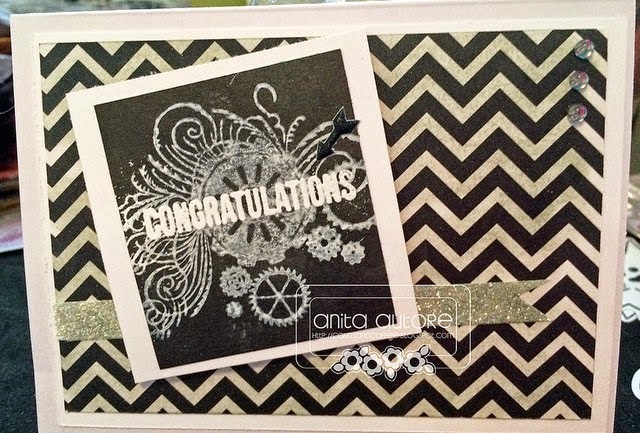 The Emerald winner is Anita and her Congratulations card. Lots of great texture! The Ruby winner is Katrina and her music layout. Such great details! Thank you very much for joining the Color Dare this week! Be sure to grab your winner's badge from the top of this page! 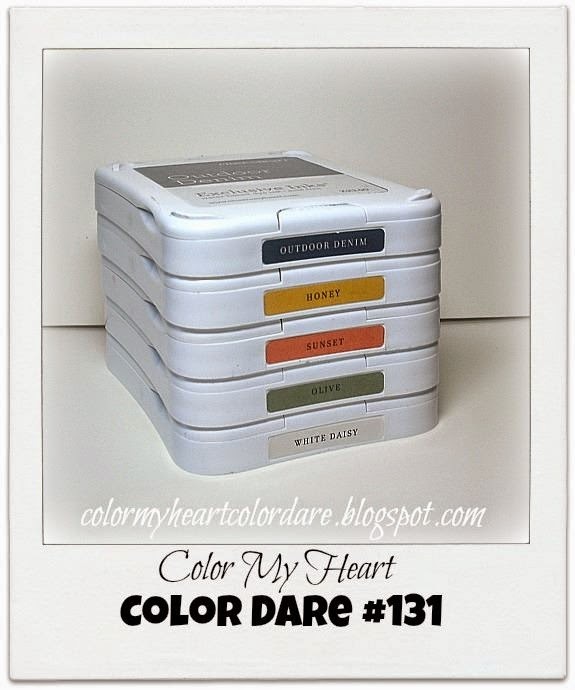 There is still time to join the Color Dare for this week: #133! The colors are: Smoothie, Honey, Flaxen, Crystal Blue, Gypsy, Black and Colonial White. If you don't have those exact colors please use something close. This Color Dare will close Thursday at 9:00pm CDT. Hi! Welcome back to the Color Dare. I hope you all had a great week. My kids have been on Spring break this week. The weather has been nice, but we only got to go out one day. We've been spring cleaning, then we all got sick! So sorry this post is late. LOL! Today I have a challenge for you with colors from our Wanderful Paper Packet. I realize this is a lot of colors, so don't try to give each color full prominence on your project. Choose a couple of main colors, then use the others for small accents. Some of our design team members have given you an idea of how to use these colors without having the paper pack. Use your creativity. I can't wait to see what you come up with! It was a five color challenge and our participants did an amazing job of creating beautiful items! It was not easy to select the winners. The colors were: Outdoor Denim, Honey, Sunset, Olive and White Daisy. Our Diamond Award Winner is frequent participant and award winning Katrina Brown with her gorgeous scrapbook page. 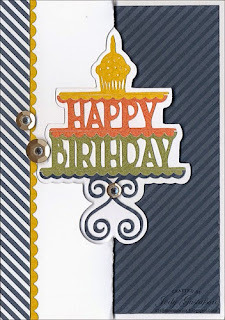 Our Emerald Award Winner is another frequent participant and award winning Jody Gustafson with her beautiful collection of Artfully Sent birthday cards. Our Ruby Award Winner is former Design Team member and award winning Becca Whitham with her beautifully stitched Happy Mail card. Our Sapphire Award Winner is last week's Diamond Award Winner Sue Reynolds with her wonderful floral card. Congratulations to all our talented Color Dare winners. If you get a chance please leave them some appreciative comments on their blogs. Now--are you ready for this week's challenge? It's just these three colors: Black, White and Whisper. Please scroll down to see the beautiful examples the Design Team has created. The challenge ends this Thursday evening at 9PM CT. Hope you can join us in the gallery! Welcome to another Black & White color dare! This week we are adding grey. A big thank you to those of you who joined us this week. You've inspired us with a variety of ways to use white and silver! 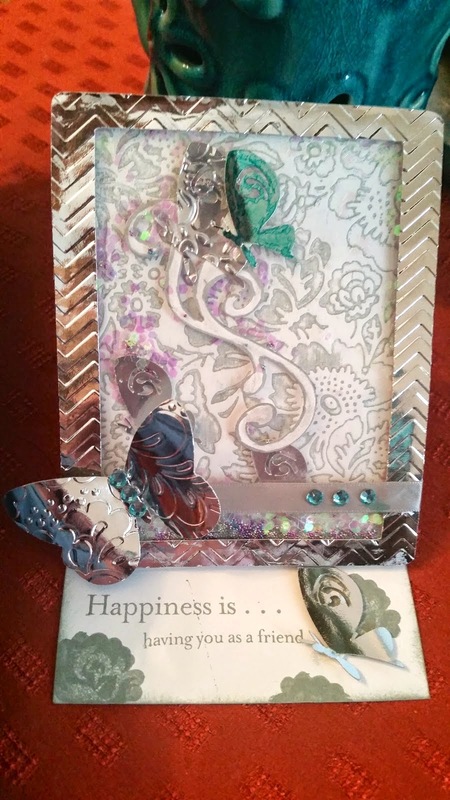 The Diamond winner is Sue R. and her stunning flowers and butterfly card. 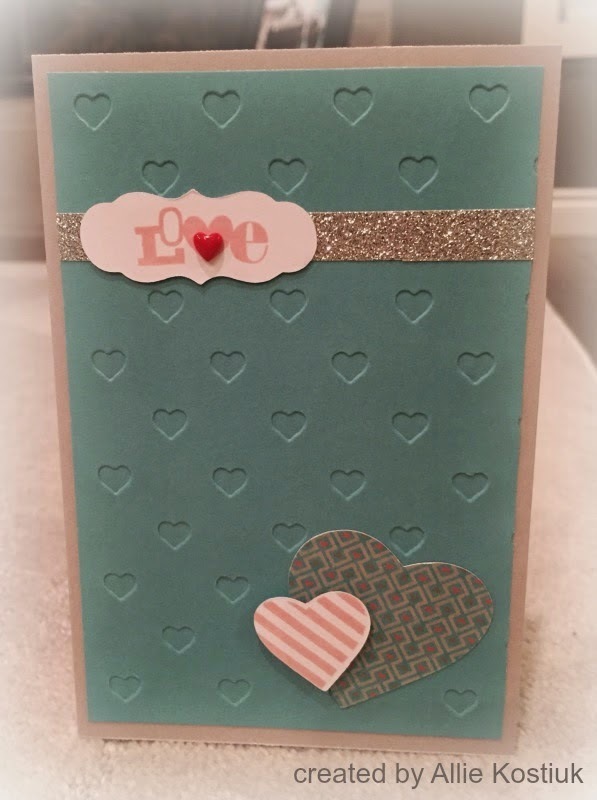 The Emerald winner is Mildred H. and her silvery shaker card! 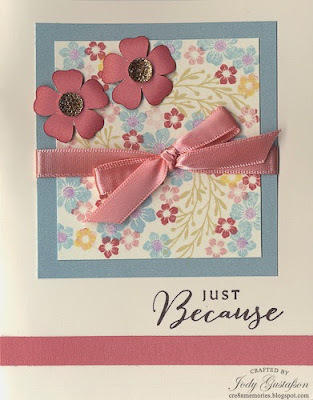 The Ruby winner is Diane M. and her pretty bow card. Thank you very much for sharing your creative talents with Color My Heart. Don't forget to grab your Blog Badge from the top of this page. Outdoor Denim, Honey, Sunset and Olive + White Daisy. The dare will close Thursday at 9:00pm CST. Come join the fun! Full details are in the sidebar of this page.